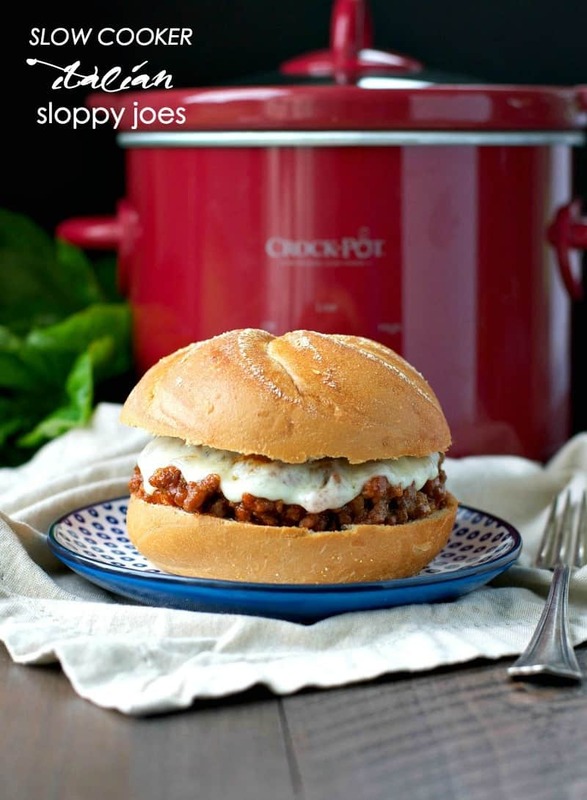 The easiest way to make sloppy joes is in the slow cooker. It takes only 15 minutes prep and does all the work for you. A super easy and delicious comfort food meal! 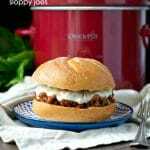 For a simple and easy dinner that your family will love, turn on your Crock Pot and let these Slow Cooker Italian Sloppy Joes simmer in your kitchen while you pour a glass of wine, help with your kids’ homework, or fold that nagging load of laundry! Whatever you choose to do, the rich combination of beef, Italian sausage, and marinara sauce will be ready and waiting for you when you return! Does your family love spaghetti? Does your family loves sandwiches? Those are two of my hungry boys’ favorite meal options, which means that these Sloppy Joes are the best of both worlds! 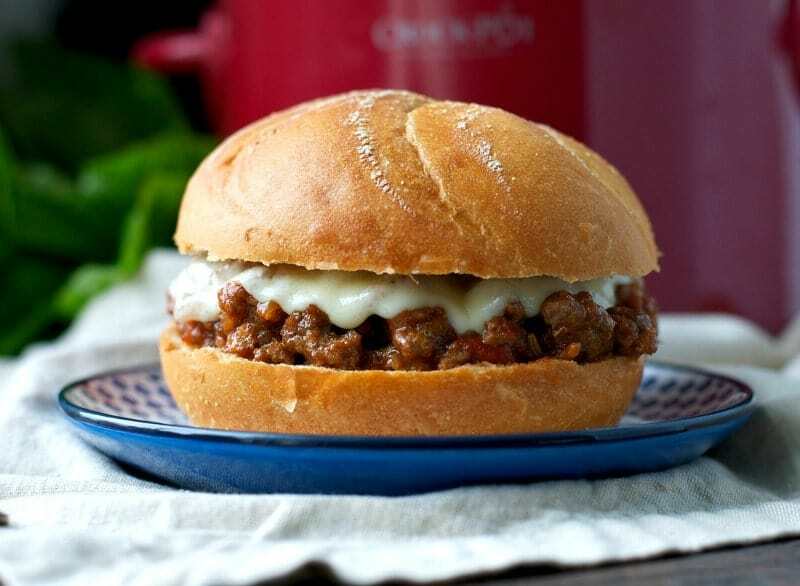 Sloppy joes are made with meat sauce that’s normally served with spaghetti but instead is dolloped on a soft bun and sometimes with melty mozzarella or provolone cheese. It’s not the most elegant of meals but boy is it delicious! These Sloppy Joes are 100% husband-and-child-approved! For this particular slow cooker recipe, you’ll want to cook the meat before it goes into the pot. If you don’t want to mess with that step on the day that you’re planning to serve the sandwiches, then you can prepare it in advance. I often cook the beef, sausage, onion and garlic in the skillet over the weekend when I have a bit of downtime. If I’m serving the sandwiches on a Monday or Tuesday, then I just keep the cooked meat in the refrigerator until it’s time to add it to the slow cooker. If you want to prep far in advance, you can freeze the cooked meat. 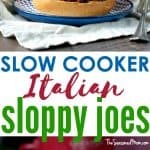 Either way, it gets that step out of the way and makes your Crock Pot dinner even faster! Heck, you could even cook the entire recipe in your slow cooker over the weekend and then just reheat the meat on the buns later for a lightning-fast weeknight supper! 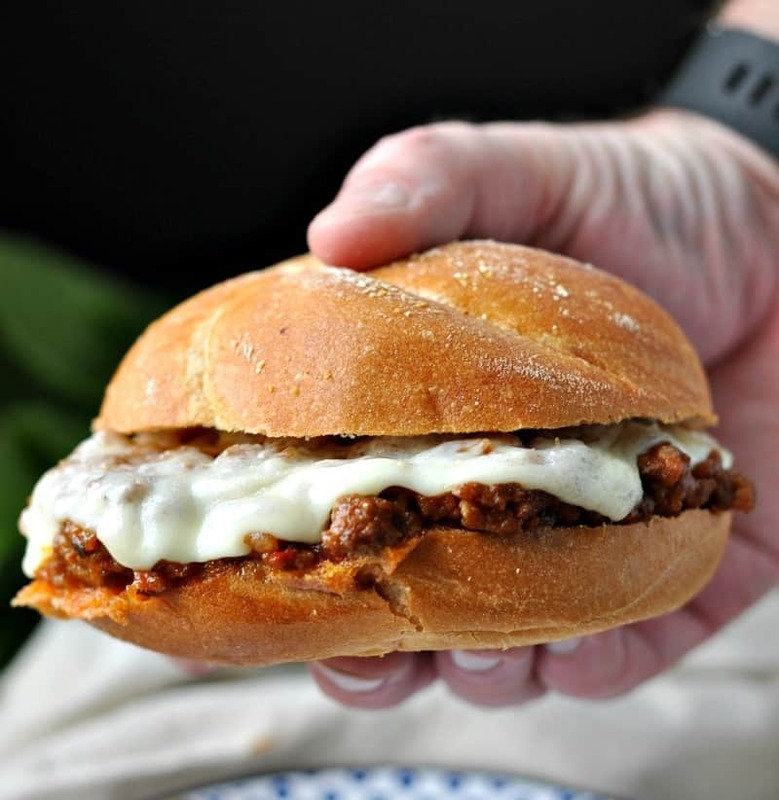 With a melted slice of provolone or mozzarella cheese on top, you’ll have a flavorful Italian twist on Sloppy Joes…made even more convenient in the slow cooker! Again, the goal is quick and easy dinners for a stress-free mealtime, and I’d call this: mission accomplished! Use a combination of ground beef and Italian sausage (removed from the casings). The sausage meat really adds a ton of flavor to the sauce! Remember to brown the meat before adding to the slow cooker. Worcestershire sauce and ketchup both add a tangy flavor to the sauce that really makes a difference so try not to skip them. Top each bun with provolone or mozzarella slices for an Italian twist. Try going for wholewheat buns for added fiber. You can freeze the meat sauce in suitable containers after cooking. In a large skillet over medium-high heat, brown beef, sausage, onion, and garlic. Drain, and transfer meat mixture to slow cooker. Meanwhile, in a large bowl combine remaining ingredients to make the sauce. Spoon heaping portions of meat onto the bottom of each sandwich roll. Add a slice of cheese and place under the broiler (if desired) for about 1-2 minutes, or just until the cheese fully melts. Place tops of the buns on cheese and serve sandwiches immediately. Spaghetti and sandwiches are definitely a favorite of my husband’s! He loves to make sloppy joes (but we call them sloppy fred’s haha), so I will have to show him this recipe. Love that it’s made in a slow cooker! oh yum!! This sounds sooo good! I want it right now! Sloppy joes always hit a soft spot for everyone, or at least I know my family loves them! I’ve never made or even tried sloppy joes (they’re not a “thing” in Australia) but Jesse often talks about them so I think I need to make these! Yum! Oh, yes…they’re a “thing” here — and Jesse would love this version! 🙂 Thanks, friend! You’re so sweet, Sarah! I’m glad that you stopped by. Slow cookers are my LIFE SAVER these days, so I’ve got tons of new recipes coming soon! Omg comfort food doesn’t get better than this. Love that I can make this in the slow cooker!